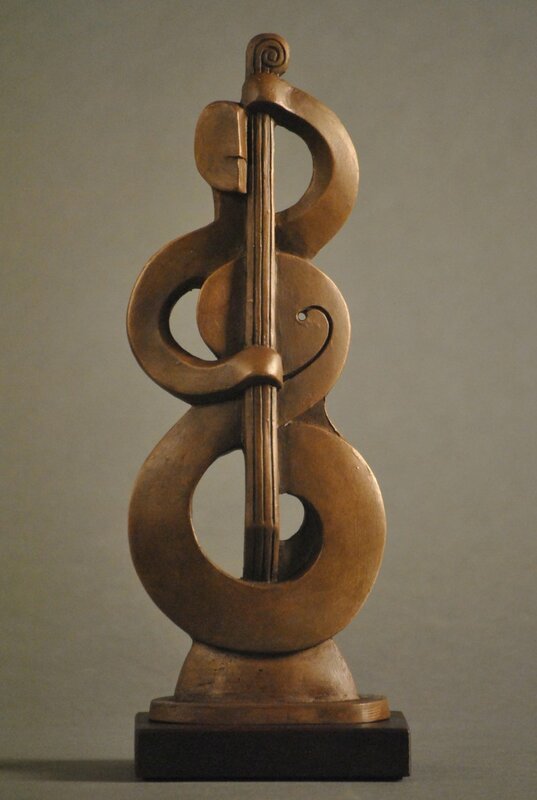 This bronze, bass player sculpture is the smallest of my "Rondo" series. It was born from a subconscious doodle I drew while listening to music. The series explores variations on the theme of a bassist and his music depicted as repeated looping forms. A Rondo is a piece of music that consists of varied, repeating forms. I like portraying bass players because I can explore the physical and spiritual relationships between them and their instruments. I am also drawn to the inherent beauty of spiral and loop forms. And, I also get to pay homage, stylistically, to the fantastic Cycladic sculpture of Greece from 1500-2700 B.C. Bronze, edition of 27 (varied patinas).